This recently enacted EU directive could have a major impact on your online interactions. Of late, there have been many questions raised over privacy and data ownership, and this Come here to find out more info; this EU site also offers additional information on this law. This CRS report is also helpful – Data, Social Media, and Users: Can We All Get Along? ; the European Parliament Think Tank has issued numerous papers on this legislation and its impact on both providers and users. Another excellent source is from the Law Library of the Library of Congress – Personal Data Protection and the EU GDPR – that points the way to other useful links. There are even implications for libraries in how they record, store, and disseminate records such as circulation transactions or online reference conversations. 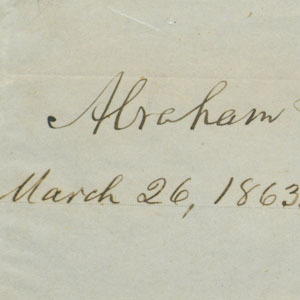 The Hay Library’s famed collection of manuscripts authored or signed by Lincoln, now comprises nearly 1,100 pieces. Why Are We Getting So Many Spam Phone Calls? Whatever happened to the “Do Not Call Registry” that almost everyone signed up for? How come we are now inundated with robocalls? As this NPR interview points out, the technology that blocks these types of calls has been superseded by marketers using more sophisticated types of equipment. And as the government does not appear to be doing anything about these breaches, we’d better get used to this situation for some time. Newark’s population grew by a mere 768 residents; Jersey City expanded by 3307 people. Emanating from NYU, the City Health Dashboard utilizes 36 key metrics in determining the health factors of a municipality. You can drill down these data to the census tract level in each city. Jersey City’s profile is replete with figures revealing the health and social indicators at the neighborhood level. You can also compare across cities as well as across metrics. There is much valuable information here; this is a source worth exploring.